New Spider-Man: Homecoming concept art reveals that two more Avengers were originally set to be included in the hit movie. Homecoming continues its success in theaters, earning over $496 million at the worldwide box office since it's debut earlier this month and the movie is showing no signs of slowing down. Since the release of Homecoming starring Tom Holland, many have wondered why there wasn't more of a presence from the other MCU characters besides Robert Downey Jr.'s Iron Man and Chris Evans' Captain America. As it turns out, Iron Man wasn't originally intended to be the lone hero from the MCU. 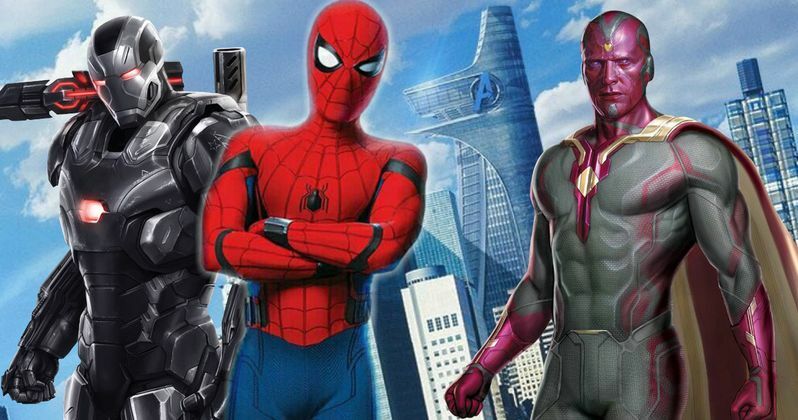 MCU News and Tweets Twitter page recently shared two pictures of concept art that clearly show Vision and War Machine helping Iron Man to aid Spider-Man during the ferry scene. Vision and War Machine would have been an obvious choice as they are close with Tony Stark. Not only would the choice have been obvious, but those characters would have elevated the scene as well. In the theatrical edit of the movie, Iron Man comes to help Peter Parker all on his own after the first encounter with Michael Keaton's Vulture. In an effort to catch the villains off-guard, Spider-Man accidentally splits a ferry full of citizens in half. Iron Man shows up to save the day to hold the ferry together and he could have used the help from War Machine and Vision to clean up Parker's mess. Iron Man was a wise choice as his inclusion in the Sony/MCU movie definitely helped to bring fans into the theater who may not have otherwise shown up, even though Tom Holland made his first appearance in Captain America: Civil War. Downey Jr. seemed to bring a legitimacy to Spider-Man: Homecoming for the fans, making it easier to accept the new Spider-Man into the MCU. Chance are that the choice may have been a financial one since Downey Jr. commanded such a large salary for a few days of work, which would make complete sense. Or maybe Vision and War Machine were busy on the set of Avengers: Infinity War. The next place that we'll see Holland will be during Avengers: Infinity War. Spider-Man: Homecoming remains to keep up with its new competitors at the box office each week, still earning money despite Wonder Woman sticking around and new openers such as War for the Planet of the Apes and this week's release of Christopher Nolan's WWII epic Dunkirk. As previously mentioned, the next place that we'll see Tom Holland as Spider-Man will be in Avengers: Infinity War to join the Avengers and the Guardians of the Galaxy to go up against Thanos, the Mad Titan. Details have yet to be revealed about specific plot points, but lucky attendees of the Disney D23 Expo last week were able to see the world premiere footage from the hotly anticipated movie, which has yet to be released online. Who knows? Maybe we'll get a sneak peak at Comic-Con today. In the meantime, check out the recently revealed concept art from Spider-Man: Homecoming below.